Expressing grave concern over kidnappings and target killings in Khyber Pakhtunkhwa in particular and across the country in general, speakers at a Conference alleged that the government itself was involved in the inhuman activities of target killings and kidnappings. 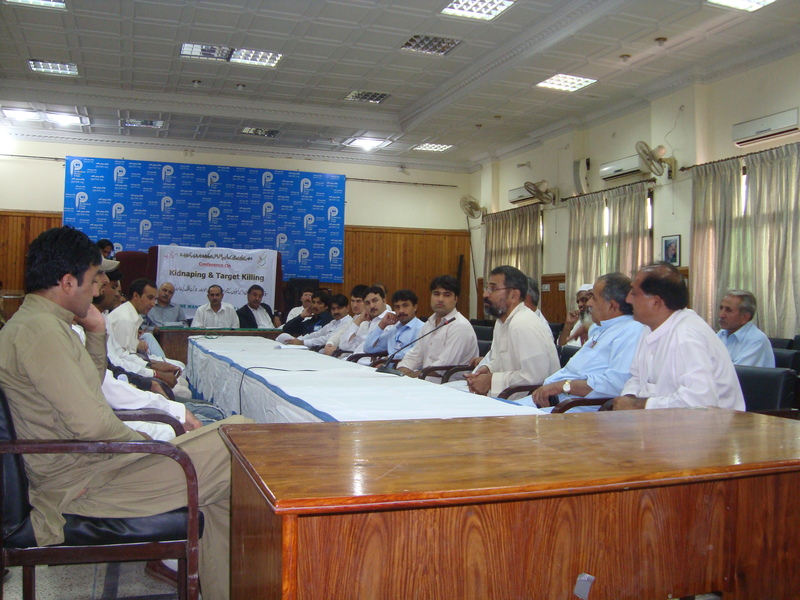 Amn Tehrik, an organization which has been raising voice for peace and Pakhtuns rights, arranged the seminar titled on kidnapping and target killing at press club on Thursday wherein the speakers jointly condemned the rampant rate of kidnappings and target killings. Members of civil societies, activists of political parties and journalists participated in the Conference and gave vent to their serious resentment over the negligence of government and the role of military in politics and held militaracy responsible for all the chaos in the region. Speaking on this occasion various participants lament state policy of strategic depth. Beside others Said Alam Mahsud, Shahab Khattak Advocate, Shahmim Shahid, Convener Idrees Kamal, Shakeel Waheed Ullah, Nazeef Khan, Aimal Khattak, Sikandar Zaman, Ghani Gul Mahsud, Zar Ali Khan, Iftikhar Khan Shangla and Afsar Khan speak on this occasion. Speaking on the occasion Said Alam Mehsud said that those people have fallen victim to target killings who had been a great obstacle in the path of militants and the establishment. He lamented over the lethargy of the teachers’ community of Islamia College and University of Peshawar and hammered them for not voicing their grudge against the kidnapping of Ajmal Khan, Vice Chancellor Islamia College University. He also bristles at the hibernation and deadly silence of Asfandyar Wali and Mehmood Achakzai amid the bloodbath of Pakhtuns but accused them that they had preferred silence over the mayhem of Pakhtuns. Shahab Khattak said that though Pakhtuns have always been a victim of international conspiracies but despite that there has been no lack of those visionary leaders who had cognizance about the exploitation of Pakhtuns but some unseen forces have always attempted to wipe out such Leadership either for their own nefarious designs or at the behest of their western lords. He condemned the killings of innocent cyclists and motorcyclists civilians by the personnel of law enforcing agencies and added that by now no suicide bomber has used either of them rather they have used cars and other costly vehicles. He expressed his searing resentment over the killing of innocent civilians either in the so-called pursuit of militants in FATA or in suspicion of suicide bombers in settled areas. Afsar Khan , another speaker, also spoke on the occasion and said that it was too unfortunate that militants and organized kidnappers factions have fleeced Paktuns in form of ransom while used the same amount against Pakhtuns. He said that Pakhtuns has been bleeding from Karachi to Bolan and from there to Khyber but no protest demonstrations take place in the so-called developed parts of Pakistan. Ghani Gul Mehsood of PPP-also gave vent to his expression and said that every one has been hankering after wealth and relegated the welfare of general masses and added that unfortunately it has especially become the norm of their politicians. He feared that the lack of rule of law, no accountability, impotent judiciary and skiing kidnappings could lead to the breakage of state. He said that a political activist must have the courage to do healthy criticism on the wrong domestic policies of his or her party which he opined could lead to the development of society and nascence of peace. He said that the state institutions have become so abased and fractured that it will take a long time to make a come back while hoped that it would come through the power of masses. Rahim Khan lodged his complaints and said that British had stabbed Pakhtuns when it divided it into two and the first ever military chief in Pakistan who was a British kept Army at the center of schemes and snipped at the rights of civilians. He said that Bengalis were clever enough because they parted ways with the conspirator Panjabi and sought a way out eternally and added that it was the only way to unyoke the all-embracing yoke of Panjab. He said that though for their liberty they sacrificed 33 million lives while lamented that Pakhtun has been dying in futility and for no ends. He accused that political wing of Pakistan Army, the dominant political hands of Punjab, and religious forces have always preferred statuesque and the politics of inertia and impeded the path of development and awareness. He said that Baloch leaders had the moral courage to confess their blunder and apologized for affiliation with Pakistan, when it asked for affiliation in the time of partition of sub-continent and urged the Pakhtun leadership to come to fore and apologize their misdemeanor as it has been proved too dear to Pakhtuns. He lamented that judiciary came into prompt move and the entire Punjab government machinery shook on a single incident of violence in Sialkot while 55 thousand tribesmen and Pakhtuns have been killed and wounded but all the incidents have gone unsung. The activists jointly passed a resolution wherein they demanded that since the investigations into the target killing of Liaqat Alli Khan, the first ever prime minister of Pakistan to the latest incident of target killings of Pakhtuns should be made public and brought before the public so that the unseen black faces could be recognized.